James Lee Burke, an author of mystery novels, said, "I used to save all my rejection slips in a box because I told myself that one day I was going to autograph and auction them. And then I lost the box." Every bridge deal contains an auction that will have stamped its signature on the different players' hands. 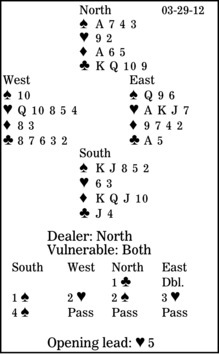 In the card play, the three active players should bear that information in mind. In this deal, declarer gains invaluable help. South is in four spades. West leads a low heart. East wins the first trick with his king, cashes the heart ace, then shifts to a diamond. How should declarer continue? After North's one-club opening bid and East's takeout double, South might have redoubled, showing 10-plus high-card points. If he had, then either his side would win the auction or it would make a penalty double of the opponents in the contract of their choice. Note West's two-heart bid. It looks very aggressive with only two high-card points, but he has wonderful distribution. If East has four-card heart support and a singleton or void in clubs, a heart contract will make a lot of tricks. And note that even here, five hearts doubled goes down only two tricks. With a club loser to come, declarer must play the trump suit without loss. Normally, he would cash the ace and king, hoping the queen will drop. Here, though, East's takeout double announced at least three-card length in each unbid suit: diamonds, hearts and spades. So, South should cash dummy's spade ace, then play a spade to his jack, a finesse that is bound to work.